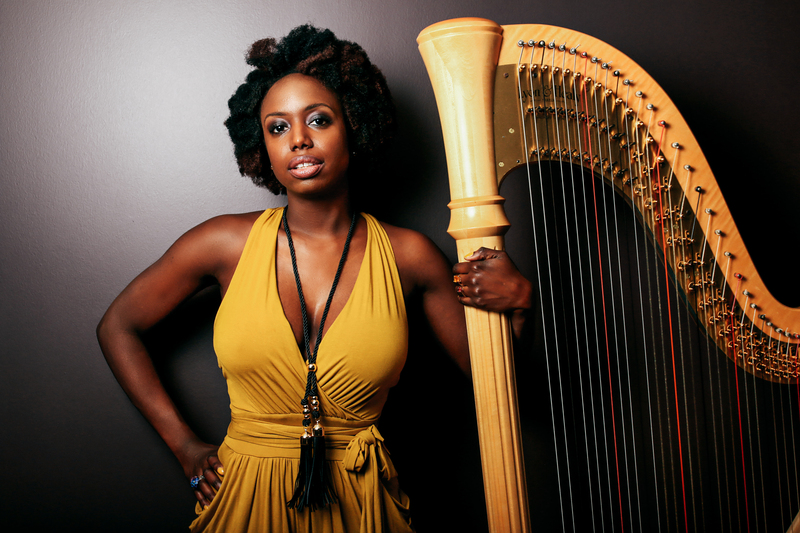 A fearless and versatile talent, harpist Brandee Younger defies genres and labels as a classically-trained musician playing in the avant-garde tradition of her sonically forward predecessors Dorothy Ashby and Alice Coltrane. Ms. Younger delivers a consistently fresh take on the ancient instrument as an educator, concert curator, performer and leader of the Brandee Younger Quartet. Ms. Younger has produced an impressive body of work since the 2011 debut of her seminal Prelude EP, including Brandee Younger Live @ The Breeding Ground, a breakthrough performance on Bluenote Records and Revive Music’s 2015 Supreme Sonacy Vol. 1 LP, and the more recent release of her critically-acclaimed 2016 Wax & Wane LP. Known for expressive interpretations of traditional harp repertoire as well as her continued work with a diverse cross-section of musical talents, Ms. Younger is widely recognized as a creative linchpin whose nuanced presence and willingness to push boundaries have made her irreplaceable on record and in performance. She has worked with jazz leaders and popular hip-hop and r&b titans including Ravi Coltrane, Pharoah Sanders, Jack Dejohnette, Reggie Workman, Common, John Legend and Lauryn Hill. As well versed in performance art as she is the art of creative risk-taking, Brandee Younger challenges commonly-held notions in her quest to ”make the harp a more relevant force in today’s music.” Ms. Younger’s ability to seamlessly inject the harp into arrangements and venues where it has historically been overlooked is a testament to her deep love for and exemplary command of the instrument. A native of Long Island, New York, Ms. Younger spent her formative years in Hempstead and Uniondale where she began harp studies as a teen under the tutelage of Karen Strauss. She received further instruction from harpists Rebecca Flannery, Susan Jolles, Emily Mitchell and bassist Nat Reeves. Ms. Younger went on to earn undergraduate degrees in Harp Performance and Music Business from The Hartt School of the University of Hartford. While there, she was mentored by the faculty of the Jackie McLean Institute of Jazz and African American Studies. An immersive experience detailed in an article by Nate Chinen of The New York Times. Upon graduating from Hartt, Reeves introduced Ms. Younger to saxophonist Kenny Garrett, with whom she would sharpen her skills in both ensemble playing and improvisation. Entering New York University for graduate school six months later, she had already established an impressive résumé, having joined the harp faculty at the Hartt School Community Division, opened for Slide Hampton as a member of Hartford based collective The New Jazz Workshop and developed a working relationship with Grammy-nominated producer and artist Ryan Leslie and Grammy Award-winning producer Omen. Building upon that foundation, Ms. Younger began working with saxophonist Ravi Coltrane on a series of concerts honoring the music of the late pianist, organist and harpist, Alice Coltrane. The study of Coltrane’s music, along with the work of harpist Dorothy Ashby, would ultimately help Ms. Younger develop her own approach to the instrument — a style that is at once striking and singular in performance. Brandee Younger’s versatility has been her passport to an array of venues and the source of musical synthesis at the core of her work. As a classical musician, she has been a featured soloist with The Harlem Chamber Players as well as the Impulse Artist Series. She has also performed with an array of ensembles including the Eastern Connecticut Symphony, Waterbury Symphony, Soulful Symphony, Ensemble Du Monde, Camerata New York and the Red Bull Artsehcro, a “non-conformist” orchestra. As well, Ms. Younger has worked and recorded with a number of jazz luminaries including Jack DeJohnette, Pharoah Sanders, Christian McBride, Ravi Coltrane, Wycliffe Gordon, Charlie Haden, Rashied Ali, Butch Morris, Jeff “Tain” Watts, Kenny Garrett, Jane Monheit and Bill Lee. Her work in r&b and hip-hop has found her sharing studios and stages with the likes of John Legend, Common, Drake, Salaam Remi and Ms. Lauryn Hill. Brandee Younger has taught at Adelphi University, Nassau Community College, The Hartt School Community Division at the University of Hartford and currently maintains a rigorous schedule as a private instructor and teacher at Greenwich House Music School. Ms. Younger has lectured and conducted masterclasses at The Royal Conservatory of Music (Toronto), University of Birmingham (UK), Tulane University, Howard University, Drexel University, Princeton University, Trinity College, The Hartt School, Elyrica Summer Music Program, Connecticut Valley Harp Intensive, NOLA Jazz & Pop Festival and she also serves as Symphonic and Jazz Harp Artist in Residence at the Cicely L. Tyson Community School of Performing and Fine Arts. In addition, she boasts a handful of bylines for Revive Music and Harp Column Magazine and holds several leadership positions as a member of the Apollo Young Patrons Steering Committee, the advisory board of the Wilbur Ware Foundation and Vice President of the Metro NYC and Long Island Chapters of the American Harp Society. Stepping away from traditional venues to bring live performance to alternative spaces, Ms. Younger recently served as curator of the weekly Harp On Park concert series “highlighting the diversity of the harp and the contemporary importance of an ancient instrument” for Arts Brookfield and is currently co-curator for “Ella, Ella: A Centennial Celebration of Mama Jazz!” for the historic Schomburg Center for Research at Black Culture of the New York Public Library. For this performance Brandee will be accompanied by Rashaan Carter. Rashaan Carter grew up in the Washington D.C. area. It was there, with the nurturing of his father, a saxophonist, and his mother, a jazz radio programmer, Rashaan forged an interest in music. After stints with various instruments, the bass became the voice for his musical expression. Rashaan worked and gained experience in the local scene in Washington D.C. and after high school, moved to New York City to attend the New School University. 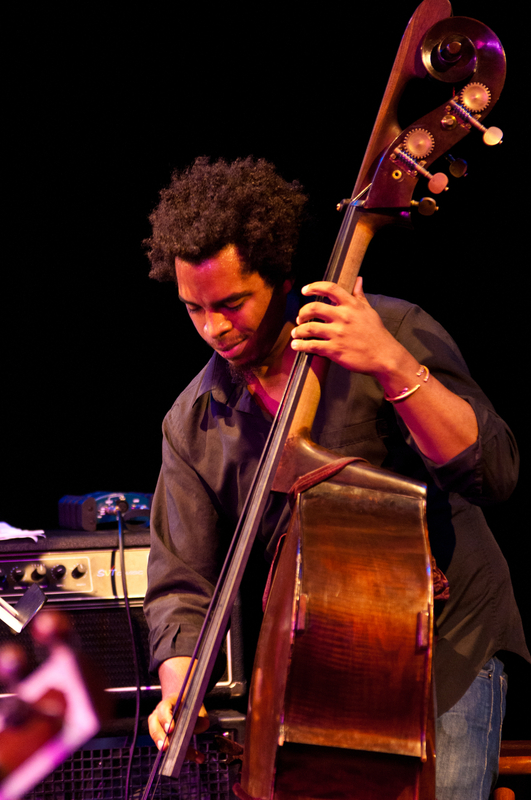 At the New School, Rashaan studied with Buster Williams and Reggie Workman. While attending the New School he also began to work with many of the faculty including Joe Chambers and Jimmy Owens, among others. Since moving to New York Rashaan has become entrenched in the jazz scene and has worked with Benny Golson, Curtis Fuller and Louis Hayes, Wallace Roney, Marc Cary, Cindy Blackman, Doug and Jean Carn, Antoine Roney, Sonny Simmons, and many more. He’s also studied with one of his prime influences, Ron Carter. Rashaan regularly performs with a myriad of artists in and outside of New York and can be found on various recordings as well. Enjoy dinner from Ty’s Taco-Ria Truck, served at 6p under a tent with gorgeous views of the valley before the performance. For tickets and more information, connect with the Roxbury Arts Group at roxburyartsgroup.org or call 607.326.7908. Online Advanced Ticket orders are no longer available. Tickets will be available for purchase at the door or by calling 607.326.7908 before 4p. All tickets purchased on the day of the event are $25.